Are you ready to take your painting to the next level? Be sure to check out this contractor friendly Wagner ProCoat 9155 3000 PSI Airless Twin Stroke Piston Pump Paint Sprayer reviews guide. It is not just easy to transport on all jobs but is also simple to store while not in use. It also features a rugged, upright cart that offers two easy-glide 8-inch wheels and a removing telescopic handle for a smooth transport. The cart also features a 5-gallon pail bracket for when you have to work on larger projects. The unique Prime/Spray knob will direct the material to the return tube when setting to “Prime” or to the spray hose when set to “Spray”. It also comes complete with the AutoOiler which is designed to provide lubrication to the fluid section of the pump. In addition, the Sureflo Valve will work to keep the inlet valve open and from sticking to dried materials. This can be easily activated by the user. This Wagner paint sprayer comes with a GS-07 spray gun. It is a 4-finger metal gun that features a swivel. It also has the 515/211 reversible airless VersaTip to accomplish a multitude of jobs. The spray gun will support up to a 0.017 spray tip. The Wagner ProCoat 9155 features an abrasion-resistant polyurethane cover on the 35-foot hose. It also has a thermoplastic inner tube designed for maximum durability. As with most Wagner paint sprayers, you are covered with a one-year factory warranty against defects. This entry to mid-level piston pump sprayer is ideal for the serious do-it-yourselfer, painting contractor, property manager and farmer. It can be used with paints, primers, and stains for a professional finish every time. As a home user, you can use this to remodel the home or take on some serious DIY projects. As a painting contractor, you’ll find that this makes your jobs easier and faster than ever before. If you have properties to manage, you can save yourself money by doing the work yourself instead of hiring a contractor. Finally, as a farmer, you can easily accomplish the refreshing of all the paint jobs on your farm machinery. Because of the straightforward operation and flexibility, it can be used on most small or large areas with ease. I do prefer it over larger areas as other Wagner sprayers like the Flexio 890 will cover furniture easier. Use it to paint or stain both narrow and wide surfaces. You’ll also achieve a great finish on a variety of materials, including wood, metal or even stucco. Despite being a contractor grade model, this unit is relatively easy to use and setup. Therefore while it is intended for someone who has advanced painting skills, it is reasonable to expect that a beginner could easily catch on to the operation. The assembly of the Wagner ProCoat 9155 is relatively easy considering the size and will only require the use of two adjustable wrenches. Start by inserting the ends of the hose bracket into the holes of the handle. Then, remove the plug from inside the hose fittings and remove the cap on the outlet valve. Thread one end of the high-pressure spray hose to the spray hose port. Hold the port with an adjustable wrench and tighten the hose with the other. Then, thread the other end of the hose to the spray gun. Hold your gun with one adjustable wrench and tighten the hose nut with the other. You’ll also want to remove the cap on your Sureflo valve. Thread the suction tube onto the inlet valve and take your time to tighten it firmly by hand for a secure fit. Make sure that the threads are straight so the fitting turns freely. Now you are ready to press the return tube onto the return tube fitting. Gently squeeze the clip over the return tube fitting to secure it in place. 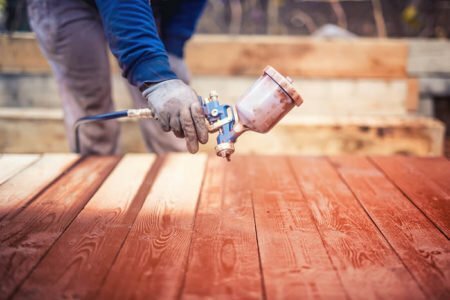 Airless sprayers are a contractor favorite as they are capable of pumping paint at high pressures. The material will come out a tiny hole found in the spray gun tip. Then the paint materials get broken up into a fan-shaped pattern made up of tiny droplets. The 5/8-horsepower motor creates an amazing airless paint spray system that is a notch above many other models. It can pump out paints or stains at a maximum of 0.33-gallons per minute and up to 3,000 PSI. The 515/211 VersaTip reversible tip will allow you to spray both narrow and larger areas all with the same tip. The pressure control dial will help you to regulate the amount of force the pump uses to push the fluid. It is capable of spraying a variety of paints, including oil-based, latex, primers, stains, preservatives and other non-abrasive materials. You’ll want to avoid textured materials, block filler, asphalt sealer or any material containing HHC. Whenever you are ready to paint, take a moment and practice first on a piece of cardboard or scrap wood. This will help to ensure that you are using the right techniques and settings for the material that is being sprayed. The cleanup process is a little more extensive due to the advanced nature of this sprayer. When using latex materials, clean components with warm, soapy water. For oil-based materials, use mineral spirits. Never use gasoline to clean a sprayer. When cleaning from oil-based materials, the spray gun should always be grounded while cleaning. Hold it against the edge of a metal container while purging. Failure to do this could lead to a static electric discharge resulting in a fire. When you are ready to take your painting to the next level, it only makes sense to upgrade to the Wagner ProCoat 9155. Its versatility, ease of use and impeccable finishes make this a paint sprayer that even the professionals adore. You’ll wonder how you ever painted without it.